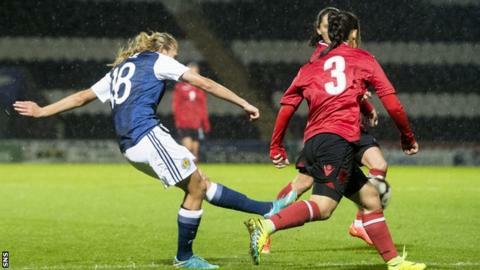 Scotland eased past Albania at the Paisley 2021 Stadium to make it two wins from two in World Cup qualifying. Marigona Zani's own goal got them underway and Fiona Brown fired home a second. Jane Ross scored her second goal in two games shortly before Claire Emslie's stunning strike. Lisa Evans headed in a fifth to round off a comfortable night for Shelley Kerr's side, who go top of Group 2. The Scots are level on points with Switzerland but have a superior goal difference. Kerr had asked her side to be clinical in the wake of a tight 2-1 win over Belarus in their opening qualifier, and predictably Scotland tested Albanian goalkeeper Zani early. Emslie had a shot spilled and Ross saw a powerful effort deflected over before heading the resulting corner wide. Emma Mitchell headed off target then Lana Clelland had a long, dipping shot punched past as the hosts continued to create chances. The opening goal arrived from the unlikely source of Albania's Zani. The goalkeeper attempted to punch clear, ran into her own player, Lavdie Begoli, and the two appeared to fall into the net taking the ball with them. But if the first was amateurish, the second was out of the top drawer. Chloe Arthur thumped a 40-yard shot that rattled the crossbar. Fiona Brown was first to the rebound, rifling home an unstoppable left-foot shot. Yet still there was a lack of cutting edge about the home side. Brown and Emslie were a joy down both wings, but the usually reliable Ross was having an off night. That all changed at the beginning of the second half with two goals in quick succession. Mitchell's shot was parried to Ross, who beat the offside trap and knocked home. Then Zani could only watch as Emslie's looping effort from out wide sailed over her and in. Albania were a beaten side. As the rain and win lashed down they looked like they did not want to be there. The opportunity was there for more goals. Mitchell clipped a shot round the post, then Brown's tenaciousness set Evans free but she was also off target. However, a minute later Evans made no mistake when she rose highest at the back post to meet Emslie's cross. Scotland were still hungry for more. Ross almost found the near post, though the visitors almost snatched one themselves when Zylfije Bajramaj lobbed a shot off the bar. Scotland head coach Shelley Kerr: "It's a start. We're not getting carried away. "In the first half I don't think we played particularly well but that's the demands we put on them. "We've not had a lot of time with the players so to implement our strategy and the way we want to play is going to take time."